Standing among the vines in the appellation of Bonnezeaux overlooking the beautiful landscape of Anjou, we had a fascinating insight into the work of the organic growers this week as we participated in the 6th edition of La Paulée de l’Anjou Noir. 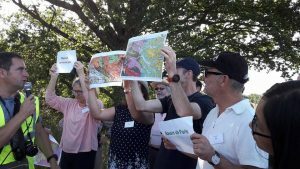 This initiative (mainly for professionals but open to interested amateurs from this year) brings together growers and experts from the region keen to transmit their knowledge and passion for growing grapes on the black slate soils of Anjou. 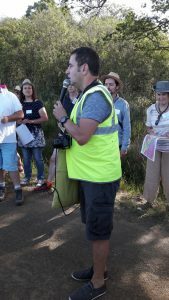 Around 300 of us gathered for a guided walk among the vines punctuated by various stops where we learnt about the geology, practices and initiatives in the area. 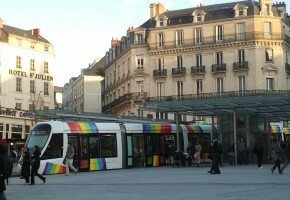 Bonnezeaux is an appellation famous for high quality sweet wine. 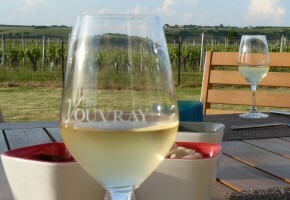 120 hectares of vines farmed by around 40 vignerons that use the single grape variety Chenin to produce wonderfully concentrated dessert wines when the weather conditions permit. We stopped first to look at the landscape with geologist Fabrice Redois from the University of Angers. It’s here that geology has a big part to play – at the point where the Bassin Parisien meets the Massif Armoricain we move from sedimentary limestone to the schist, slate soils of ‘black Anjou’, peppered with spilites, quartz and phtanites. 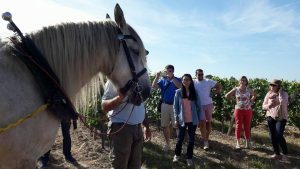 Our second stop was to hear about working vineyards by horse. These beautiful creatures take 6 years to train and have to be treated like athletes. It’s incredible to see how such large animals can work with such precision and gentleness. There are many benefits of using horses rather than tractors – growers are more in touch with their soils and they can work the ground when it’s wet and muddy (something that can’t be done with a tractor without damaging the soil structure). Quite a lot of organic growers are using horses in the vineyards and they use contractors who specialise in this kind of work. It takes patience and time but is beautiful to see. Treated properly and not worked too hard, they can work until roughly 17 years old and then have a well earned retirement in their old age. 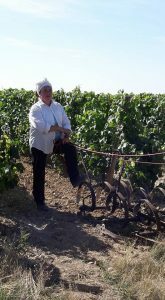 Our final stop was at the estate of Mark Angeli, a renowned grower that has been working organically for many years. It was fascinating to hear him talk about agroforestry (a land management system that involves the planting of trees or shrubs among the vines to produce a more diverse, productive, healthy, ecological and sustainable environment). 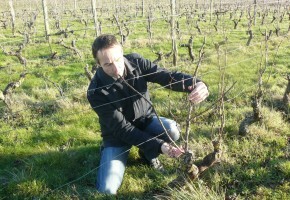 Here he has planted apple trees among a 50 are plot of Grolleau vines.The idea is that the trees provide a natural habitat for a wide variety of animals that in turn control the pests that can cause problems in the vineyard. He has also top-grafted a small parcel. This is when you remove one grape variety and regraft with another variety. 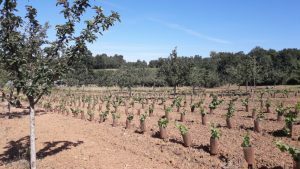 The benefits of this are huge – the host vines are already established so the new variety is up and running much more quickly than if you plant a vineyard from scratch. Year one sees around 60% production and the vines are in full production in year two. He made a very interesting point about the method of grafting too which was of particular interest. Most grafting these days is done by machine and uses what we call an omega graft ( it looks like a little jigsaw puzzle piece). According to Mark Angeli the older system of grafting à l’Anglaise (whip and tongue) is much more effective and also increases the vines resistance to Esca (the biggest problem in our vineyards today, a fungal disease that kills around 5-15% of vines every year). A tasting of a large selection of wines from the producers involved followed by a delicious meal in the cool of Domaine les Grandes Vignes barrel cellar made for a perfect day full of discovery and new contacts within the Anjou wine trade. Sommeliers, cavistes, restaurant owners, hoteliers, journalists and wine tourism professionals each took a bottle to share over a very long and lazy lunch. What’s going on in the vineyards in September 2018? 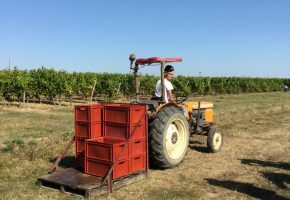 Harvest is in full swing here in the Loire and for the first time in three years we are seeing broad smiles on the faces of our partner growers as they bring in decent volumes of lovely looking grapes. Another amazing wine from Jo Pithon, his Coteau des Treilles 2009. We have a few bottles of a few different vintages in our cellar and it’s a while since we tasted the 2009. 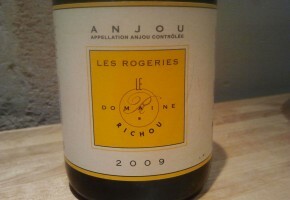 Les Rogeries 2009 – delicious Chenin Blanc from Domaine Richou in Anjou.